“Barbara and I are so sorry we can’t be there for your Inauguration on January 20th,” he wrote on Jan. 10, Politico reported. Trump sent out a tweet in response to the letter, thanking the former president and wishing him a quick recovery. Looking forward to a speedy recovery for George and Barbara Bush, both hospitalized. Thank you for your wonderful letter! President Barack Obama, Presidents Bill Clinton, George W. Bush, and Jimmy Carter have all said they’d attend Trump’s inauguration. 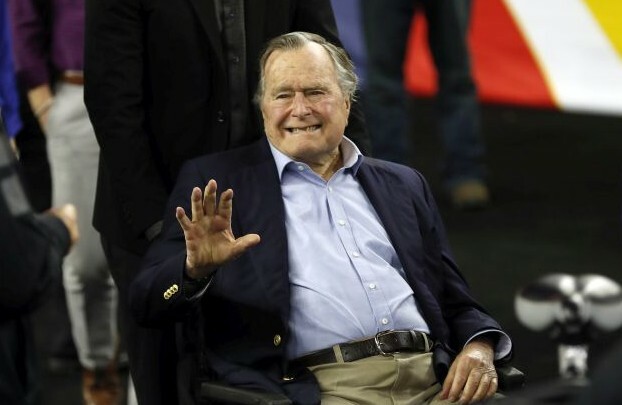 The elder Bush, who is 92, didn’t attend Obama’s second inauguration, citing health concerns. “Doctors and everyone are very pleased, and we hope to have him out soon,” spokesman Jim McGrath told the Associated Press. Bush’s chief of staff, Jean Becker, told the Houston Chronicle and KHOU-TV that Bush is expected to go home in a couple of days. Bush, who served as U.S. president from 1989 to 1993, has a form of Parkinson’s disease and uses a motorized scooter or a wheelchair for mobility. He was hospitalized in Maine in 2015 after falling at his summer home and breaking a bone in his neck, and was hospitalized in Houston the previous December for about a week for shortness of breath. He spent Christmas 2012 in intensive care for a bronchitis-related cough and other issues.